Nope. Instead, I am going to get right to the goods, because THE GOODS ARE REALLY GOOD! Besides, by now, you know the palooza drill, and if you don’t — well, here are the other PFA Poet-a-Paloozas to bring you up to speed. Before we get to the REALLY GOOD GOODS, I have to announce a NEW-new edition in the series. Check it out! No, your eyes do not deceive you! 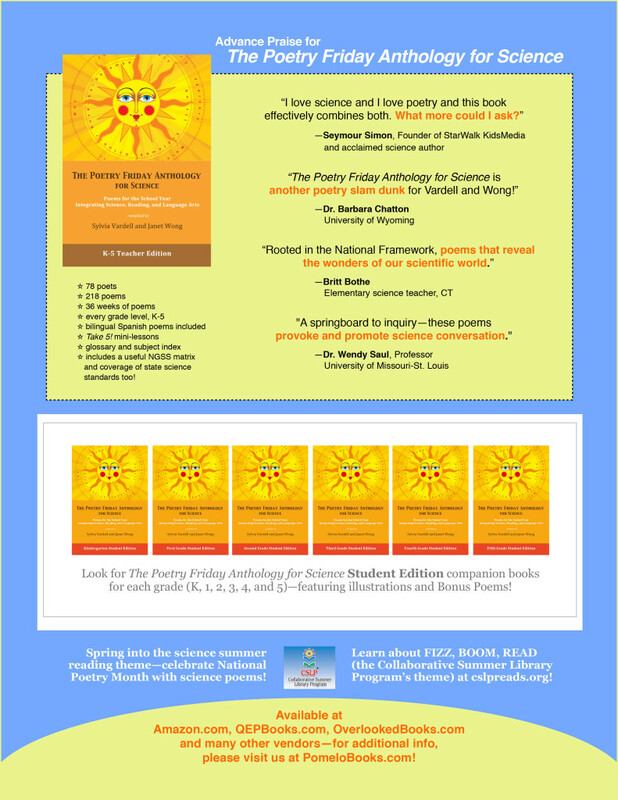 The Poetry Friday Anthology for Celebrations is due out in March/April 2015. If that’s not something to celebrate, then I don’t know what is. Yeehaw! …fell in love with the sound and taste of words when she was a pre-schooler. She studied Latin in high school, which she feels made it easy for her to learn languages. She’s fluent in French and Spanish and has tourist get-around skills in several other languages. 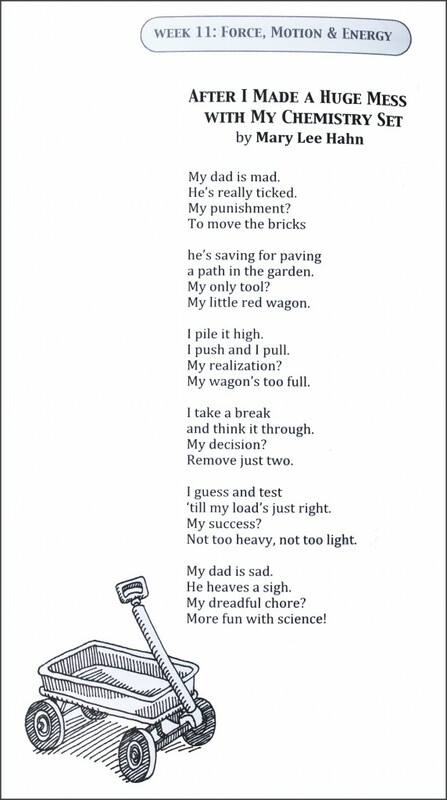 She started writing rhyming stories when a friend’s son simply could not learn to read (he’s now an MD). An art historian by training, Bobbi worked as a social worker for Head Start, an environmental writer for the Cousteau Society, and an editor at Random House. She’s written over 85 books under her own name and pseudonyms, and writes lyrics for a classical composer when invited. 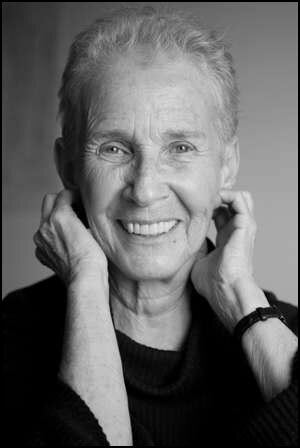 Her main focus is a memoir in verse and essay, as well as a Step Into Reading biography of her hero, Nelson Mandela. Bobbi’s books include A Rumpus of Rhymes, The Monsterologist: A Memoir in Rhyme, Once Around the Sun, and the anthology Pocket Poems. Learn more about Bobbi and her work at BobbiKatz.com. 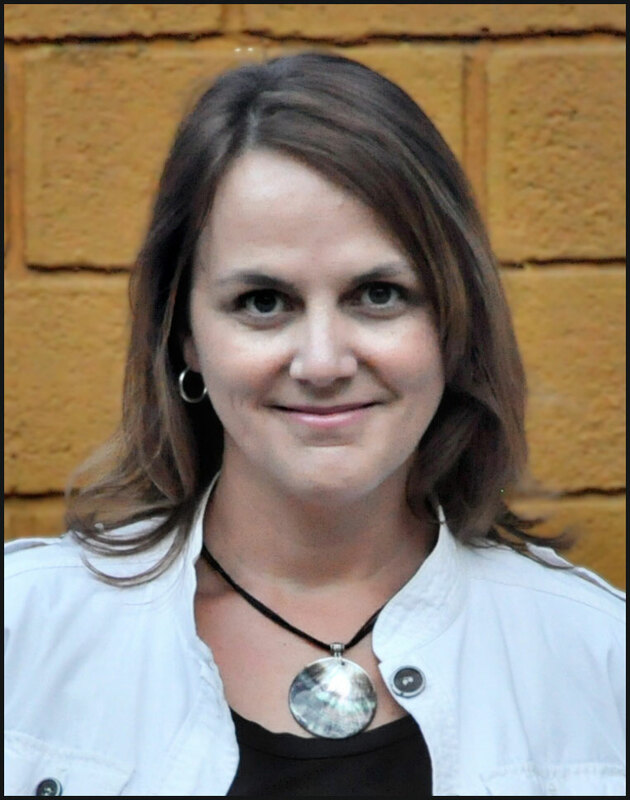 …is a children’s author and the librarian at the American School of Belo Horizonte, Brazil. Her books include Me With You (Philomel), Mini Racer (Bloomsbury), Surfer Chick (Abrams), and A Dance Like Starlight (Philomel). She is an experienced presenter to all age groups and often does writing workshops with elementary, middle, and high school students. 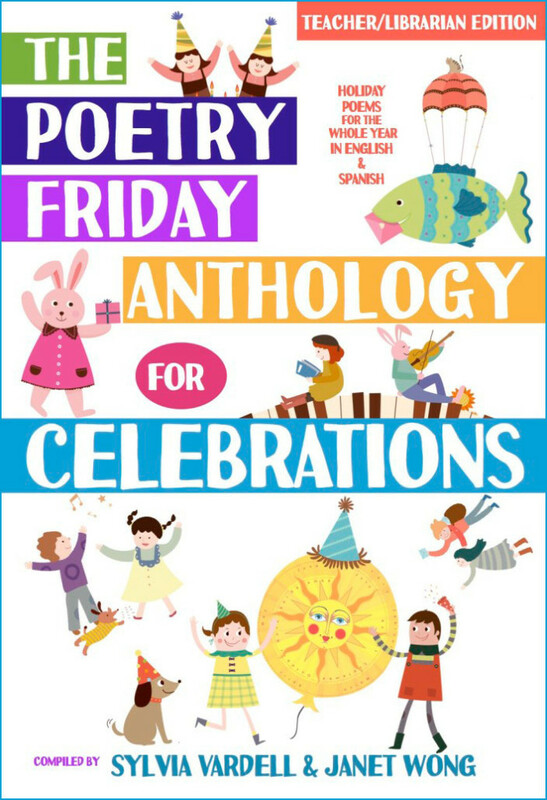 Her poetry has appeared in various anthologies, including the recent Poetry Friday Anthologies which help teachers connect poetry across the curriculum. Her visual literacy presentations support both Common Core and International Baccalaureate standards and provide both students and teachers with the tools they need to deepen inquiry in the classroom. Originally from South Carolina, United States, she has lived in Belo Horizonte, Brazil, since 1998. Find out more about Kristy at KristyDempsey.com. …is a 5th grade teacher in Dublin, Ohio. She has taught 4th or 5th graders for more than 25 years. She wrote Reconsidering Read-Aloud (Stenhouse, 2002) and blogs at A Year of Reading with Franki Sibberson. 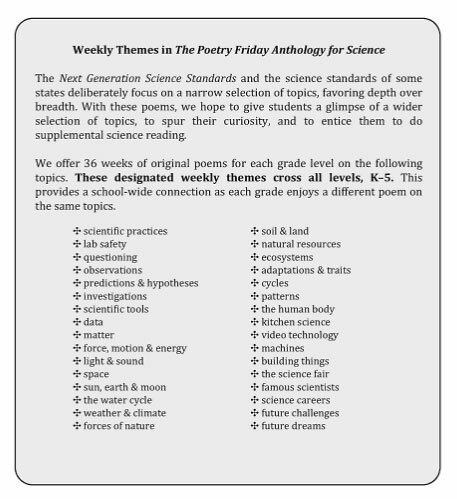 Mary Lee’s poems appear in the K-5, Middle School, and Science editions of The Poetry Friday Anthology, and her poetry website is MaryLeeHahn.com. Along with being a teacher, writer, and poet, Mary Lee fly fishes, gardens, and bakes amazing cakes. …has worked in educational publishing for over 30 years. 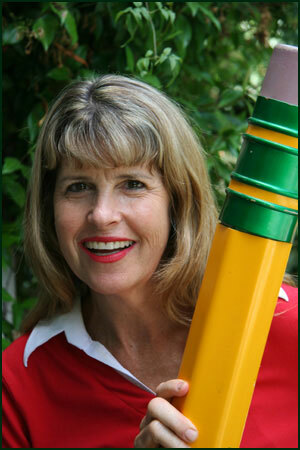 On the clock, Suz hones her skills by writing for the K-8 audience and teaching writing workshops. On her own time, she dabbles across the genres. Besides a long list of early readers, Suz is the author of several picture books: Rembrandt’s Hat, Brownie Groundhog and the February Fox, Brownie Groundhog and the Wintry Surprise, and the upcoming Twelve Days of Christmas in Oregon; a middle grade biography, Cleopatra: Egypt’s Last and Greatest Queen; and an award-winning collection of poetry, Nest, Nook & Cranny. Musts include strong milky tea, Cheez-its, narrow-ruled yellow tablets, and #2 Ticonderogas. …has taught biology to college students and natural history classes to students of all ages. 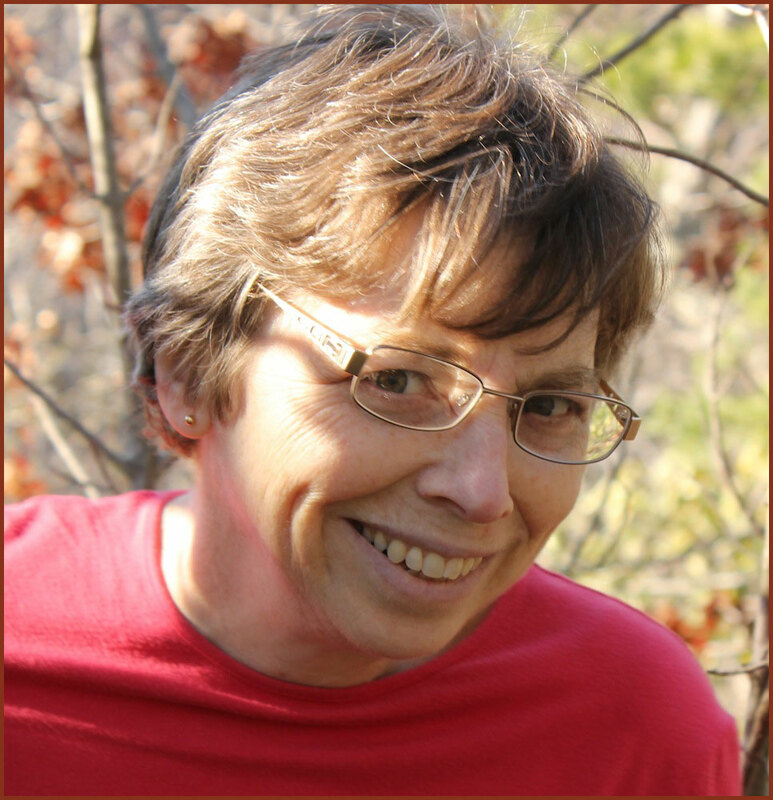 Her fascination with the natural world has been a focus of much of her writing. 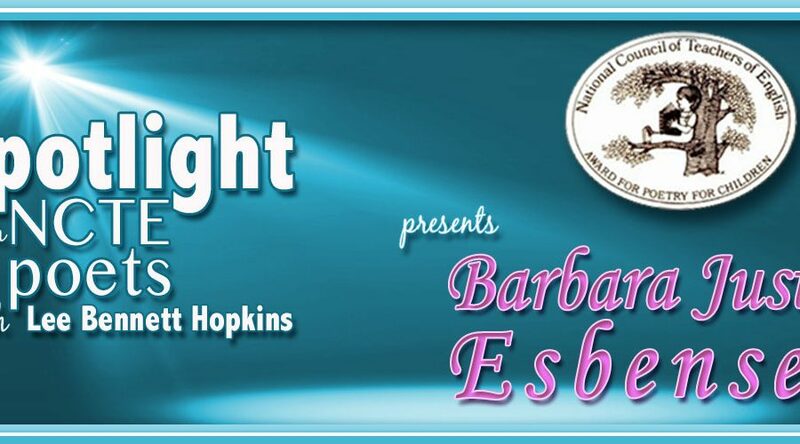 She is the author of more than 60 nonfiction books for young readers and many stories, articles, and poems for children’s magazines. She particularly enjoys writing poems that feature quirky facts from the natural world. Buffy shares her love of science and writing when speaking to school children in Michigan. Find out more about Buffy at BuffySilverman.com. 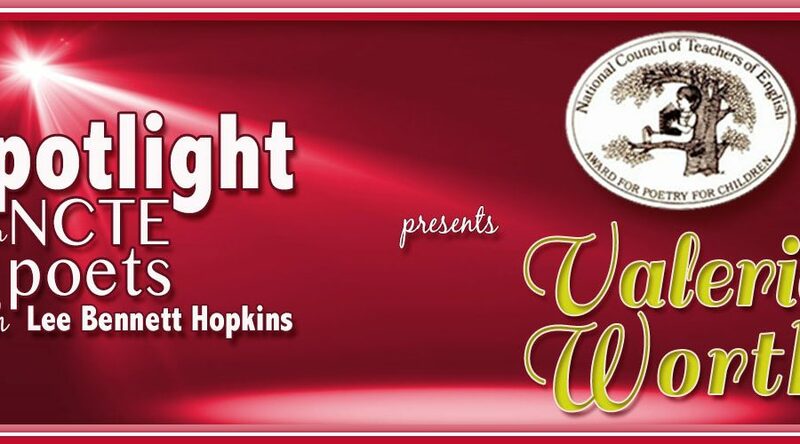 …is a poet and an author of many children’s books including To Rabbittown, a Scholastic Blue Ribbon Best Seller; It’s Not My Turn to Look for Grandma!, recommended on PBS’s “Storytime”; New Year at the Pier, winner of the Sydney Taylor Gold Award, and the award-winning Girl Coming In for a Landing—a novel in poems. 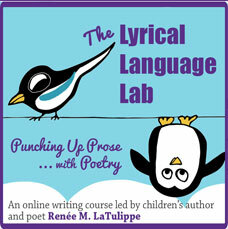 Her poetry appears in countless anthologies and on the US Children’s Poet Laureate’s website, poetryminute.org. 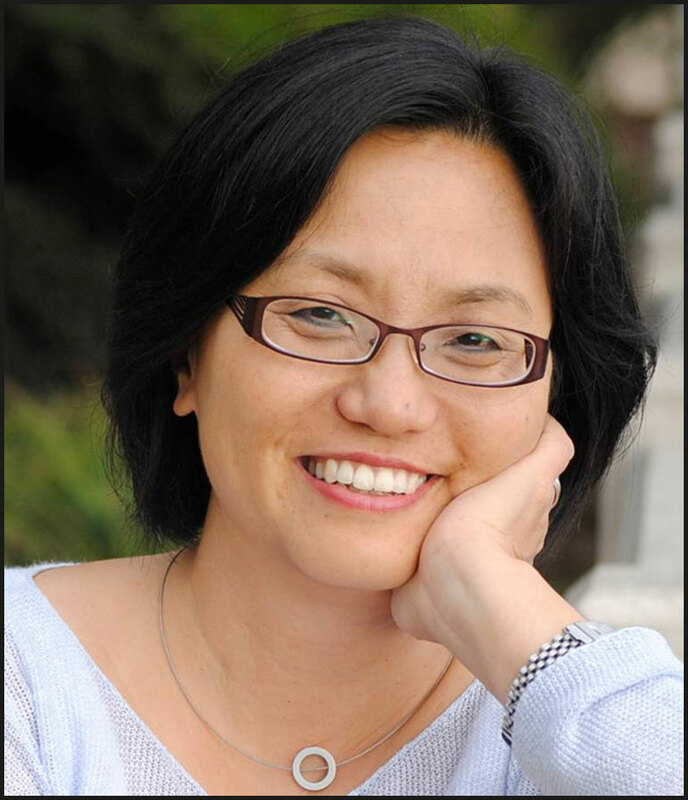 She’s taught in over 400 schools in England, Italy, Germany, France, and Poland, has been an instructor in UCLA Extension’s Writers’ Program for more than 15 years, and blogs with five other children’s authors TeachingAuthors.com. …is the author of several novels and picture books, including A Single Shard, the 2002 Newbery Medal winner. She writes fiction and poetry for both adults and young readers. 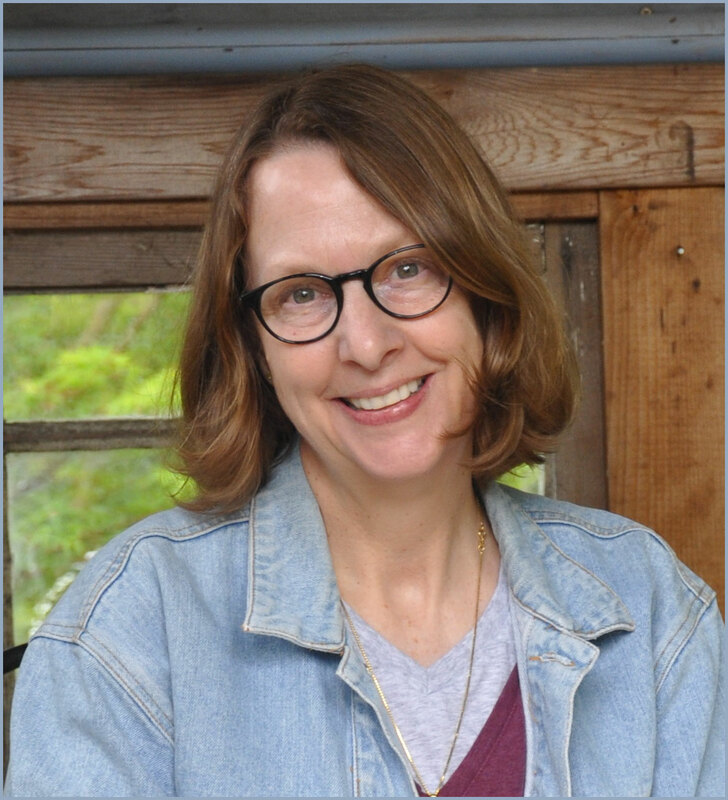 Her most recent titles are A Long Walk to Water, a New York Times bestseller and winner of the Jane Addams Peace Prize; Trust No One, Book #5 in THE 39 CLUES/Cahills vs. Vespers series; and the picture book Xander’s Panda Party, illustrated by Matt Phelan. Linda Sue knows very well that she will never be able to read every great book ever written, but she keeps trying anyway. Visit her website at www.lindasuepark.com and follow her on Twitter @LindaSuePark. How great was that? 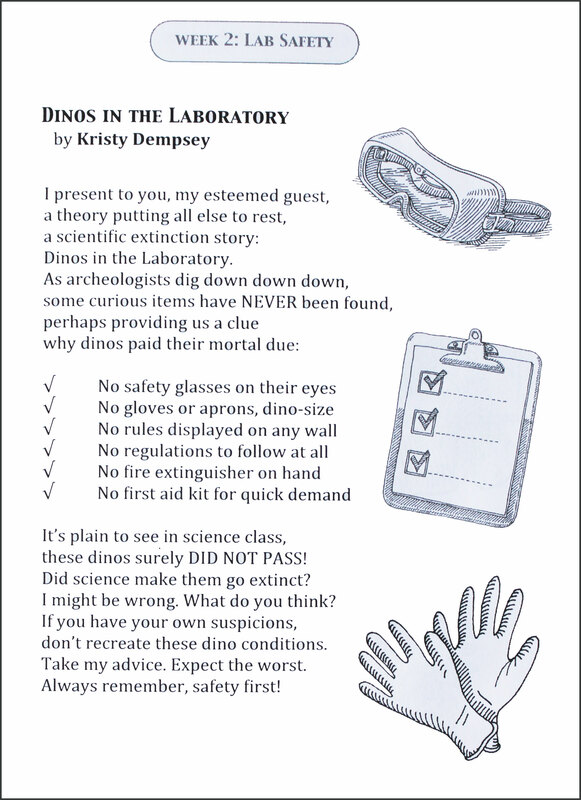 I hope you’ve enjoyed this look inside the marvelous and important Poetry Friday Anthology for Science. It really is a treasure for both teachers and students. Here they are, all seventy-eight of them! Click the links to see their work and find out more about these talented folks. 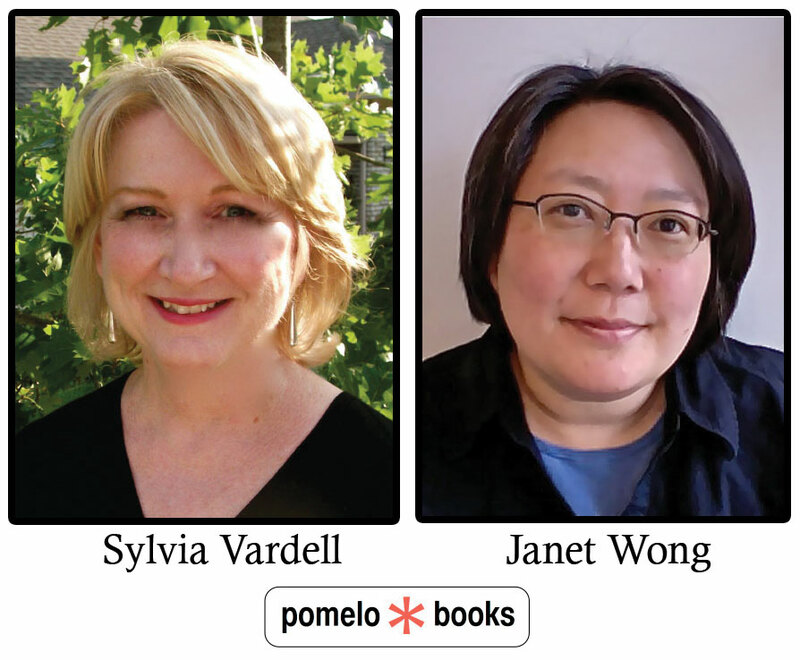 Where to buy: Right here at Pomelo Books, where Janet and Sylvia have various versions available, from the complete anthology to single grade-level versions. 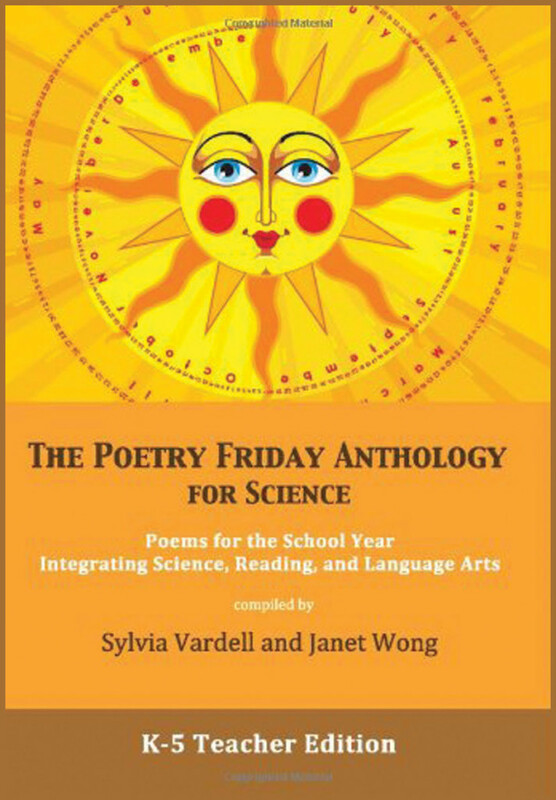 to Janet, Sylvia, Bobbi, Kristy, Mary Lee, Buffy, Suz, April, Linda Sue, and all the PFAS poets for joining me at No Water River and for creating this science-rific poetry resource! 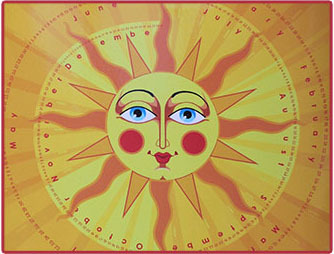 Cathy has the Poetry Friday roundup at Merely Day By Day. Hop on over! 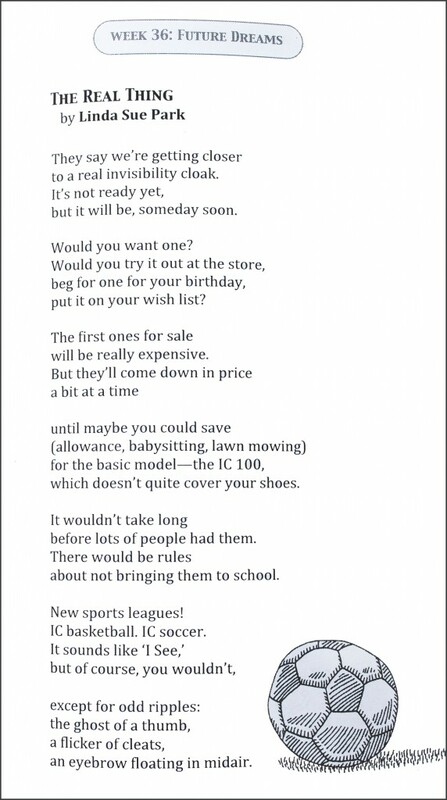 You want to receive weekly poetry posts in your inbox, you say? Just sign up in the sidebar! 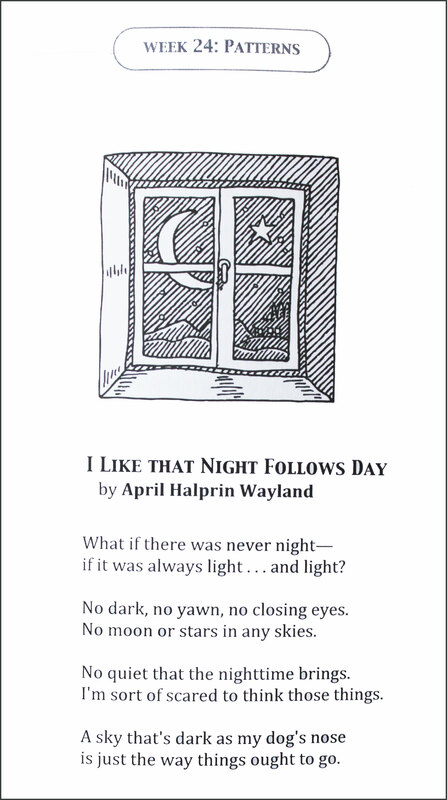 All poems copyright 2014 by their respective authors. I have all these anthologies, have shared the books with colleagues and the poems with students. 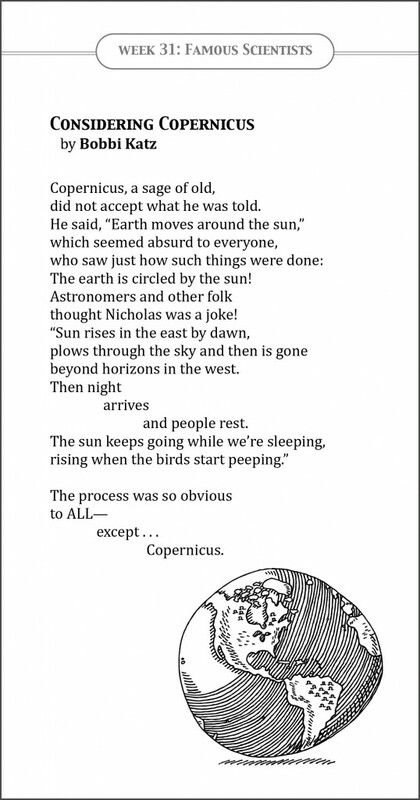 It’s delightful today to see the ‘wonder’ in your selected poems, Renee. 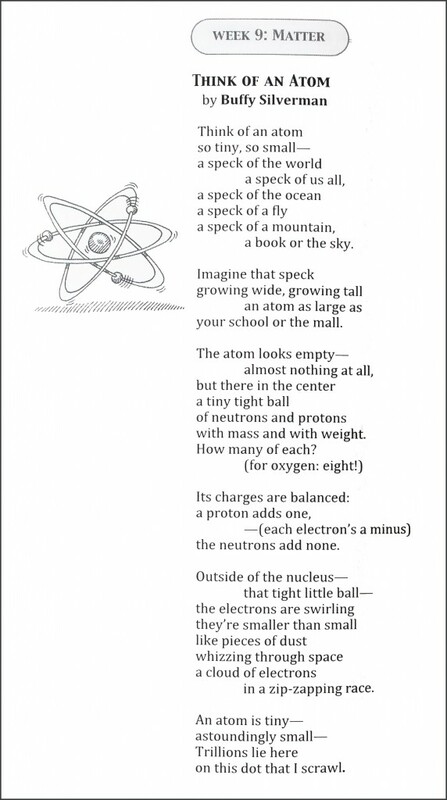 And isn’t that what science is all about? Thanks for all! So true, Linda! And I love how each poet expresses that wonder in a different way. Wow-Wow!-WOW!!! These goods are GREAT! Thank you, poets, and Eli (with your night nose) too!!! Renee, this post is resource rich! Thank you for sharing — and getting the party started. 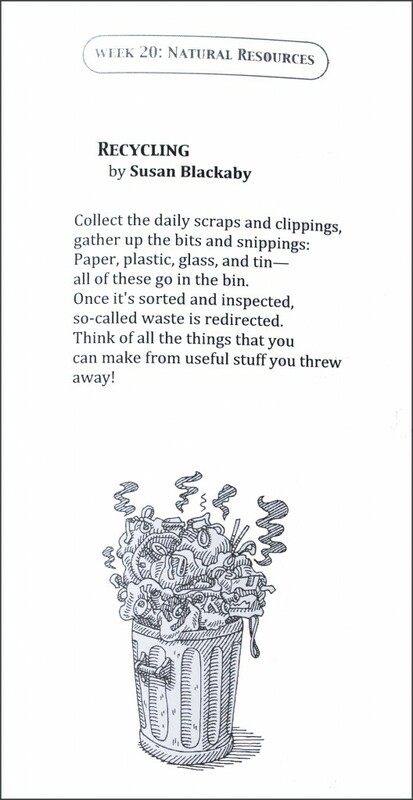 It’s a marvelous collection of poems! I really wish my kids were young enough for me to use it with them. But, I’ve been enjoying reading them on my own. Congrats on your being included in these anthologies, Renee, though I’m not one bit surprised that you would be! Thank you so much, Renee, for all your work on this– polished to a golden gleam. You are such a pro in every way. Thank you, poets, for your fun and engaging videos and of course your fabulous poems and all your support too! What a beautiful poetry family! It IS a lovely poetry family! Well put, Sylvia. What an amazing collection of poems. I love listening to them read aloud, and I want to know where to find a field of sunflowers like that. Those are wonderful! Thanks for sharing so much of it! This is a wonderful series of posts. I love hearing the poets read their work. Thank you for the links to all who contributed to the anthology. Thank you for this, Renee! And to each of the poets as well! Wow! What a lot of work you put into this post, Renee! (and into ALL your posts!) Loved hearing all the poets read their own work and learning a little bit more about your featured poets. Janet and Sylvia do such a marvelous job with their PFA Anthologies! So glad to be part of this community! I finally got a chance to watch the videos and enjoyed them so much! Wonderful poets all. Great job, as always, Renee! What a great way to showcase these stellar science poems. Wonderful! Total enjoyment. Thanks for the PALOOZA, Renee! The Poetry Friday Anthologies are such a brilliant concept and such a help to teachers!